Opening reception is on December 11th from 6-8 pm. This exhibition runs from December 11th to December 18th. Monte Vista Projects presents Arrangement Against Content by Caitlin Mullally. Arrangement Against Content is a sculptural sound installation that addresses domestic beauty and its relationship with conceptual art. Caitlin Mullally has been researching the art of arrangement in relation to sound, china and floral combinations, exploring the tropes of comfort and safety of the “feminine” as a quality of these formats as the containers of meaning. The artist is interested in the atmospheres and feelings created by domestic spaces, as well as regarding them as poetic experiences, and how we consciously and unconsciously construct notions of comfort. The piece discusses the presumed absence of content or aesthetic value of those environments, questioning the lack of need for interpretation in domestic spaces. The installation is inspired by the atmospherics of paintings by James Abbott McNeill Whistler. Caitlin Mullally is a sound artist who specializes in collaborative installation work. Her work revolves around collaged ideas. She has previously shown her work at C.A.V.E. Gallery (2016), California Institute of the Arts (2016), Tiger Strikes Asteroid, (2016), Ranney (2015) and the American Red Cross in Tinton Falls New Jersey (2014). She was raised in New Jersey and lived in the United Kingdom. She currently lives and works in Los Angeles, California and is earning her BFA at California Institute of the Arts. 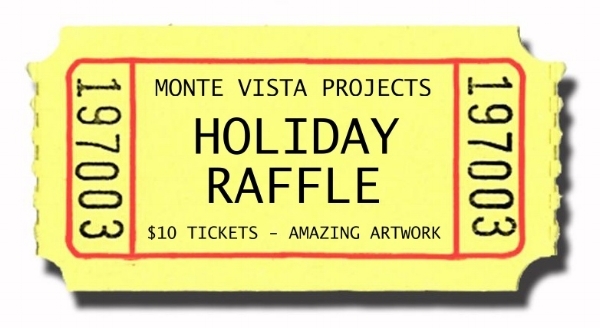 All of the proceeds go towards maintaining Monte Vista Projects, including preparing for future exhibitions by Zac Bucek, Kelly Loudenberg, Bessie Kunath and Nick Loewen and many more. We are very appreciative for the ongoing support we have had over the last nine years and we hope to continue providing a space for underrepresented artists. Oct. 30th to Nov 20th, 2016. Steven Putz’s most recent work,(The Hanging Garden) an installation using props, sculpture, and set design techniques, pays homage to the notorious Aokigahara Forest in Japan(also known as The Suicide Forest) . The artist discovered The Suicide Forest during a recent exhibition where he displayed works that addressed the issue of suicide in Japanese culture. The forest was used as part of a practice called Ubasute during the famines in the Edo period (1603-­‐1868). In which, family members would abandon their ill and elderly there in an effort to better ration dwindling food supplies. A majority would have certainly perished due to exposure, inadvertently making Aokigahara Forest Japans most haunted location. More recently (1950-­‐present) the forest has become Japans number one suicide location. Presently the authorities no longer post the number of suicides occurring within the forest in an effort to avoid attracting negative publicity and romanticizing the deaths. However, the popularity of this location continues to increase in the media; Vice Documentaries, New York Times, Japan Times and numerous online sources have all reported on The Aokigahara Forest. And by the time Steven’s installation is presented, MTV will have released The Forest, a film using Aokigahara as a backdrop. Furthermore, several well received books have been published regarding the forest. Steven Putz’s Hanging Garden balances between a sense of mystical horror and historical fact, between knowing what is present and what is the past. His installation invites viewers to step beyond what they might recognize as their own mortality. Steven Putz received his MFA from Cranbrook Academy of Art. He has exhibited in group shows like I Heart Japan, Duke Gallery, Azusa , CA,. and Ghost Show VI, Borderline Gallery, Milwaukee, WI. He has received international awards for his printmaking. Steven has completed one novel and coauthored a novella, both unpublished. Though rarely exhibiting throughout his career, his works appear in private collections and have been purchased by such institutions as The Haggerty Museum. Steven resides in Los Angeles where his studio practice continues. This one day event will take place from 6-8 pm along with a curatorial talk at 7pm. from August to October 2016, including pop-up exhibitions in art venues and galleries. In Los Angeles, the No Show Museum is hosted by Monte Vista Projects. At the opening on the October 30 at 7 pm, Andreas Heusser, Curator of No Show Museum, will guide through the exhibition and give an illuminating introduction (lecture performance) to the art of nothing. Sierra, Andy Warhol and Rémy Zaugg. The NO SHOW MUSEUM has a mobile presentation space in a converted postal car. It currently hosts a special exhibition entitled „Nothing is impossible“ with a selection of impossible artworks by 22 international artists. The mobile museum has been shipped from Europe to America and will be installed in front of Monte Vista Projects. Combining half of a child size doll, drawing replacing the doll's front, and video eyes sourced from the Benghazi hearing, Hillary Clinton As A Child speaks to the construction of a larger than life identity over time. The mention of just the name Hillary Clinton brings an immediate response. From where do we form an opinion of our politicians? Based on a childhood photo of Hillary, HCAAC stands as a reminder of Hillary’s history, that she was not always the Hillary Clinton we think we know today. "For on television the politician does not so much offer the audience an image of [herself], as offer [herself] as an image of the audience." Jenn Berger is a Los Angeles based artist. She earned an MFA in art from the University of California, Irvine and undergraduate degrees from Art Center College of Design in Pasadena, CA and Tulane University in New Orleans, LA. Recent exhibitions and performances include The Quiet After 10 curated by Emily O, Violence, Nudes, and Grandmas at The Situation Room, and Another Cats Show at 356 Mission. She recently completed a teaching artist fellowship at the Armory Center for the Arts in Pasadena, CA. (Los Angeles) – Monte Vista Projects is excited to announce A Simple Chemistry Experiment Explained as a Monument by Manny Krakowski. On exhibit will be a sculpture that appears to be a monument, complete with virtual space, and a surveillance system. Some things need to be physically diagramed. To describe in a way words cannot. A diagram is a symbolic representation of information according to some visualization technique. Diagrams have been used since ancient times, but became more prevalent during the Enlightenment. The Enlightenment was marked by an emphasis on the scientific method and reductionism along with increased questioning of religious hegemony. This period marked a shift of how knowledge was perceived as truth through the use of scientific methodology and objects (experiments) to describe virtuality. This virtuality is a kind of potentiality that becomes fulfilled in the actual. It is still not material, but it is real (according to Delueze). This exhibition measures how the monument, surveillance, and virtual space affect our experience of place. Distance Between Here and There. Freezlume Between Freezer and Volume. Gallery Hours are 12 - 5 p.m. Saturday and Sunday or by appointment. Manny Krakowski is obsessed with Minecraft, chemistry, and sports through the lens of desire. Krakowski received a Master of Fine Arts degree from the School of Art at California State University (2016), Long Beach. Over the past 10 years Krakowski has served as Artist in Residence and staff member at the Pilchuck Glass School, WA. His work has been published in New Glass Review through the Corning Museum of Glass, NY. He has exhibited at Edward Cella Art & Architecture, Los Angeles, Los Angeles Municipal Art Gallery, Los Angeles, University Art Museum, Long Beach, City of Brea Art Gallery, Brea. In addition, he has given lectures and demonstrations nationally and internationally at such institutions as Australian National University, California State University, Fullerton, Ohio State University, and Santa Monica College. Krakowski co-organizes WINNING/LOOSING a project space in Los Angeles. Programing focuses on performance and site-specific exhibitions. Los Angeles Vernacular: Space Capsule Interior evokes a multiplicity of temporalities and aesthetics. Among them, it references the Back-to-the-Land-Movement that over different generations flourished in the United States, and had important iterations in the outskirts of Los Angeles, in places like Tujunga. Stone builders such as George Harris settled there in the early twentieth-century, and began building with local materials, including river rock from the Tujunga wash. By taking industrial sheet metal and turning it into rocks, this installation also makes reference to the anti-industrialization philosophy of the early craftsman movement, which made a commitment to unique, hand crafted domestic architecture. Furthermore, it continues a syncretic tradition of construction in Los Angeles that has long served as a metaphor for multicultural coexistence, particularly as builders such as Dan Montelongo, an Apache Mescalero, mastered in the early decades of the twentieth-century the construction of homes that brought together an indigenous way of building with river rock in combination with the craftsman aesthetic. This came to be known as a vernacular style of construction that flourished in local neighborhoods such as Sunland, San Fernando, Tujunga, La Crescenta, and Pasadena. In addition, this installation evokes the hippie communes of the 1960s and 1970s, such as Drop City in Colorado, where structures were built in the form of geodesic domes with diverse materials, including recycled sheet metal, following the patented designs by Buckminster Fuller that were made available to the general public in 1966 through a publication of Popular Science magazine. It is also inspired by the design of the spacecraft Dragon series that Space-X has advertised as manned orbit vehicles for the near future. Los Angeles Vernacular: Space Capsule Interior slides back and forth from a past of local materials to a future of extinction, taking place at once within different versions of modernity, being both obsolete and innovative, a relic of the past, a model for the present, a nostalgic dream for the future. Beatriz Cortez: is a visual artist and a cultural critic. She was born in El Salvador and migrated to the United States in 1989. She holds a Masters in Fine Arts from the California Institute of the Arts and a doctorate in Latin American literature from Arizona State University. Her work explores simultaneity, the existence in different temporalities and different versions of modernity, particularly in relation to memory and loss in the aftermath of war and the experience of immigration, and in exploration of possible futures. She has shown her work nationally in Los Angeles, San Francisco, Washington, D.C., New York, and internationally in El Salvador, Guatemala, and Costa Rica. She teaches in the Department of Central American Studies at California State University, Northridge. She lives and works in Los Angeles. Organized by Rebecca Bennett Duke. Interior of Ford Explorer Sport; Aliso Canyon Wire Markers; Mats; Northridge, CA 91325; Fly Fishing; and EDC. A thought in a car. “Lens flare” is a phenomena in photography and cinema that occurs when non-image forming light enters and refracts within the glass components of a camera lens before reaching the camera’s film or digital sensor. The visible artifacts typically manifest themselves as starbursts, rings, or geometric shapes in a row across the image. These artifacts are a common obstacle in photography, usually suppressed through the use of coated lenses, hoods, and lighting technologies. However, the use of lens flare as a signifier of the presence of a documenting camera is suffuse within filmic culture today as a tool for lending reality to an otherwise fabricated digital world; in CGI sequences lens flare gives the illusion of a camera filming a scene that was digitally fabricated inside a computer. Greg Curtis’ exhibition Event October Horizon at Monte Vista Projects is an installation of framed chromogenic prints wherein the mechanics of the camera lens itself are the sole object. With a camera pointed at a black backdrop in the artist’s studio, a light was pointed into various lenses to produce and record isolated lens flares. The resulting images are at once diminutive and expansive: portraits of the camera’s own machinations presented as vast extraterrestrial events. The images are paired with identically sized black monochromatic chromogenic prints that contain no information from the camera, pointing to the spaces between still images that construct cinematic sequences. The installed panorama consists of self-reflexive operations made with the fundamental apparatus of the entertainment industry, isolating and foregrounding what is usually considered at best an aesthetic flourish, and at worst an error on the part of the photographer. Greg Curtis’ works in photography, video, and animation have recently been exhibited at the Conley Gallery at CSU Fresno; The Institute of Jamais Vu, London UK; Elephant, Los Angeles CA; Hedreen Gallery at Seattle University; Concord, Los Angeles CA; Weekend, Los Angeles CA; Cirrus Gallery, Los Angeles CA; Land of Tomorrow, Lexington KY; and Dan Graham, Los Angeles CA, among others. He received an MFA from California Institute of the Arts and is based in Los Angeles. Monte Vista Projects is pleased to present Corey Fogel: Theater of Haecceity, an ambient room for contemplated and performed gestures. An experimental composer, percussionist, artist, and collaborator across disciplines, Corey Fogel creates work drawing on strategies of improvisation, chance, and community. He uses site-specificity and performative action to conflate the senses with the sublime, collapsing aural, haptic, and synesthetic experiences, often to absurdist ends. Theater of Haecceity uses the gallery as an atmospheric playground for combining sound experiments and art-object scrutiny, a personal instantiation of the artist’s headspace, of what happens when he is there and an audience is not. Distorting traditional, fixed conditions for both theater and gallery, the exhibition will build on aleatory parameters interposed over time. To facilitate the otherwise disparate modes of 'concert' and 'exhibition', a provisional fabric sculpture lines the entirety of the room – a formal complication to the minimal white cube, functioning simultaneously as a monochromatic environment, a curtain, and a lens. Like an origami fortune teller at monument-scale, an angular swath of garish pink fabric defines a square antiprism center stage for kinetic sculptural improvisations, and four corner chambers concealing live musicians or playback speakers, contingent upon the daily program. New compositions for four performers will be recorded and broadcast quadraphonically, accumulating into a collage over the show’s duration, shattered and shuffled algorithmically. The resulting thisness will be a record of inspired actions and unlikely marriages between materialities seen, heard, and felt. Corey Fogel (b. 1977) holds his MFA from the California Institute of the Arts, and his BFA from Arizona State University. He has presented his work with LACMA, The Hammer Museum, Redling Fine Art, Human Resources, the wulf, and Machine Project, amongst others. In 2014, Fogel was awarded The California Community Foundation Fellowship in Visual Arts. He frequently performs and records music nationally and abroad. Opening reception is on Sat 2/27/2016 from 6pm - 9pm. Exhibition runs until 3/20/16. Monte Vista Pojects is proud to present an exhibition of new paintings by Los Angeles artist Tran Truong. Truong's recent paintings depict spatial relationships between everyday objects and urban situations, rigorously abstracted into a hyperflat two-dimensional space. Telescoping groups of red, yellow, and green circles on a black background evoke a barren city street at night. A vertical band of color terminating in a large triangle carries the winkingly literal title “Umbrella”. In another work, a vertical stripe on the canvas's surface looks like nothing so much as an orthographic projection of a road making its way up a steep hill. Much color field painting (as epitomized, for example, by the work of Ellsworth Kelly) has traditionally drawn its vocabulary of shape from nature, while obscuring that very act of sourcing through radical formal simplification. In contrast, Truong's motif's identities are almost comically explicit, placing her canvases in a curious zone of overlap between illusionism and literalism. Their heraldic simplicity owes an uncertain debt to their originating inspirations, which they overwrite without precisely representing. These paintings adapt the historical language of “autonomous” art, but make no claim to autonomy. Deprived of the contextual markers that traditionally anchor pictorial depiction, Truong's spare geometries float adrift in the viewer's mind, tossed by waves of association, only distantly moored to their literal subjects. Truong's work has been shown in group exhibitions throughout Los Angeles and the bay area. She is currently a 2016 MFA candidate at the Milton Avery Graduate School of the Arts, Bard College. This will be her first solo exhibition.